The sisters Martha and Mary make an interesting study in contrasts. Martha is an efficient go-getter. The Bethany home she shares with her siblings is called "her house" (Luke 10:38). She takes the initiative for the dinner party and obviously knows just how she wants the evening to go. It involves lots of details, which I'm sure she delights in, except she needs a little help. Mary is the dreamy impractical one. 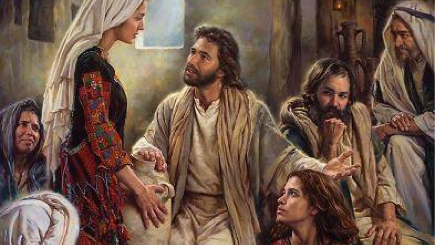 While Martha flits around, Mary sits around, oblivious to Martha's "much serving" list and completely engrossed in Jesus and His words. The contrast between the two sisters is seen again in another incident. It's another dinner in Bethany where again Martha serves (John 12:1,2). This time Mary does more than listen. To show her love for Jesus she pours perfume on his feet and dries them with her hair (John 12:3)! Who but a dreamy, impractical soul would think of something like that? I believe Martha and Mary were different at a basic level. I think they were both right in serving and loving Jesus according to their makeup. Martha's mistake was to try and force Mary to leave her way of serving Jesus and do it Martha's way. Jesus' reprimand was probably an epiphany moment for Martha as He focused her on the value of what Mary was and was not doing. I like how my Bible's commentary gets to the core of these differences. "Martha's legitimate concern was to be a proper hostess. Mary's concern was to be a proper disciple. Jesus does not negate Martha's hospitable activities but is concerned with her distractions, worry and trouble about many things which cause her to underemphasize the one thing that is needed (Luke 10:42) that is to hear the word of Jesus" J. Lyle Story, commentary on Luke, New Spirit-Filled Life Bible, p. 1408). My sympathies have always been with Martha in this story. In my own life I see a tendency to get hung up on the practical details of service and ministry while losing sight of the big picture. And I would also like some support in my busy-ness. Perhaps you too? Through this story we hear Jesus remind us, Don't be worried and troubled about many things. One thing is needed—to listen to My words. Your pursue that in your way and let others do it in theirs (my paraphrase). PRAYER: Dear Jesus, help me to be a disciple in the way I have been created, while giving others the freedom to be themselves in the way they love and serve You. Amen.